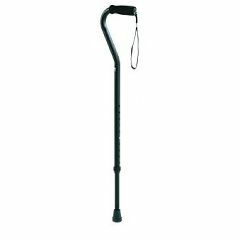 Height adjusts from 29" to 38"
The Carex Black Adjustable Offset Aluminum Cane have a soft cushioned handle with wrist strap to improve comfort and grip. They also allow for easy height adjustment with only a push of a button or a few turns of their unique twist shaft. Good Quality &amp; Very Affordable! Long Term User. Disabled . Basic and dependable, worth the price. Where is it manufactured and what is the weight rating?